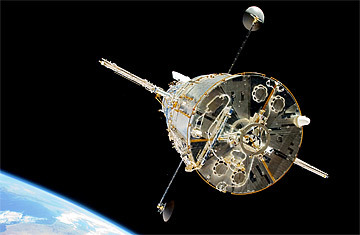 It hardly bears mentioning that the orbiting Hubble Space Telescope is one of the most extraordinarily successful scientific instruments of all time. Since 1993, when the telescope's flawed mirror was set right by a set of custom-fit corrective lenses, the Hubble has captured one spectacular image after another of everything from the familiar planets of the solar system to quasars and galaxies at the edge of the visible universe  and thanks to four repair missions by shuttle-riding astronauts, the telescope has managed to survive the harsh environment of orbital space far longer than anyone could have imagined. All good things must come to an end, though. The shuttle is flying no more, and within the next couple of years, the aging telescope will gradually wink out too. It will be a terrible loss to science, and it kind of makes you wish someone had a spare Hubble secretly stashed away, just waiting to be unpacked and sent into orbit. That's what would happen in the Hollywood version, anyway. But it turns out that it is happening in real life too. The National Science Foundation has just revealed the existence of not one but two pristine, Hubble-class space telescopes still in their original wrappings in a warehouse in Rochester, N.Y. The pair was originally built for the National Reconnaissance Office, the agency in charge of spy satellites, to look down at Earth rather than up into space. But the NRO has moved on to bigger and better instruments, and decided to hand the telescopes over. "It just blew me away when I heard about this," says Princeton astrophysicist David Spergel, a member of the National Academy of Science's Committee on Astrophysics and Astronomy. "I knew nothing about it." The unexpected gift has sent NASA and the astronomical community, both of which have learned to live with smaller budgets and lower expectations in recent years, into a mild state of shock. It's not clear what they'll do with this astonishing gift  and indeed, even among the handful of scientists who have been in on the secret, there's only a general consensus on how they might use just one of the telescopes, never mind both. "Everyone I've talked to," says Spergel, "has said we should follow the Decadal Survey." That is the once-a-decade report astronomers present to NASA with a wish list of space missions, ranked in order of importance  establishing a sort of united front that relieves the space agency of having to decide on its own what science projects are the most crucial. In the most recent Decadal Survey, issued in 2010, the astronomers asked for a new space telescope sensitive to the infrared light that comes from newborn galaxies and planets, and with a much wider field of view than Hubble's sharp but narrow eye. This proposed scope, known as WFIRST (the Wide-Field Infrared Survey Telescope), would also study dark energy and matter, but in order to save money, it would be less than half of Hubble's size. With the news of the free telescopes, however, astronomers are talking about the possibility of building a "WFIRST-plus." The basic scope  mirrors, mountings, enclosure  that they'll be getting from the NRO makes up somewhere between one-third and one-half the cost of the finished product; the rest goes to the instruments that process and record cosmic light. "We can do it better, and potentially cheaper, because we don't need to buy the telescope," says Spergel. "What's not clear is, Do you just have the original infrared camera, or do you take advantage of this opportunity to add, say, a coronagraph?" That would be a big deal, since the job of a coronagraph is to block out the blazing light of a star to let the much dimmer light of a planet shine through. With it, says Paul Hertz, NASA's director of astrophysics, the telescope could capture images of Jupiter-like planets around nearby stars and possibly Earth-like planets as well  an achievement astronomers thought wouldn't be possible until late in the 2020s. But while the free scopes are essentially there for the taking, there are a lot of hurdles to overcome. The cost of adapting cameras and other instruments to the rest of the components, then launching the whole thing and operating it for years won't be insignificant. "A 50% discount still means you have to come up with the other 50%," says Spergel. Still, getting the new scope into space should at least be cheaper than it was to launch the Hubble. "Hubble," he says, "is really a 1960s-era telescope. It's very heavy and fairly long. This one will be lighter and smaller." Even with drastic upgrades, Hertz says, it's plausible that it would cost just $1 billion to adapt and launch the proposed WFIRST  an absurdly low figure for such a powerful machine. As for the second free telescope, the consensus so far, says Spergel, is that "we wait until sometime in the 2020s to decide what to do with it." At the moment, the James Webb Space Telescope, the Hubble's official successor, is eating up the lion's share of NASA's science budget, and even at a discount, there's no way the agency can move ahead with both of the unexpected freebies at once. All these ideas are preliminary, however. "A few of us began discussing this quietly when we first learned about it," says Spergel, "and now we'll be talking to the wider community." It will take a while, he says, before there's a concrete plan on how to move forward. Until that happens, astronomers will just enjoy the improbable fact that they've been given two shiny, brand-new toys to play with  and Christmas is still half a year away.